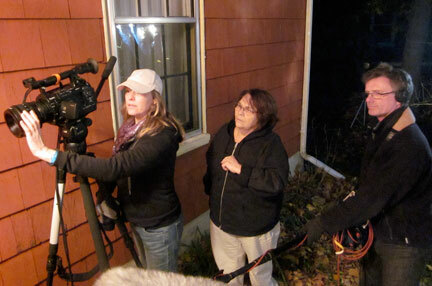 IFF member Louise Lalonde recently wrapped the shoot for her new short The Appointment. The film stars Murielle MacDonald and Olivia Barnes. Shot in both English and French on location in Charlottetown, The Appointment is about a young woman who desperately seeks guidance from a fortune teller. Becky Parsons has worked around the globe and is currently based in Toronto. Having worked with Lalonde on previous projects, Becky jumped at the chance to shoot this new film. Louise Lalonde has been involved in film for well over a decade and has many short films to her credit. She is the founder/director of the highly successful PEI Screenwriter’s Bootcamp.